January 6th is Epiphany and Twelfth Night: the traditional end of the Christmas festive season. By choosing this date for the celebration of the visit of the Magi, the Church was giving Christian significance to existing pagan midwinter festivities. It was the day before a general return to the rigours of work (Plough Monday), and therefore a last chance to make merry. 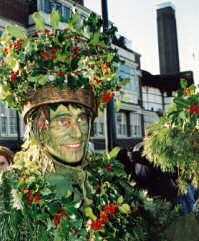 The Green Man is deeply rooted in a whole host of customs and traditions. He is also known as the Wild Man, Jack-in-the-Green, the Green Knight, the May King and sometimes Robin Hood. He is irrepressible life. When George Gasgoine appeared to recite verses of greeting to Elizabeth I at Kenilworth in 1575 he was dressed as "the Savage Man all in ivy"
Folk plays are performed at Midwinter all over England. They were generally referred to as "Mummings" or earlier as "Guizings", and disguise played a big part. Records exist of such an entertainment at the court of Henry IV. There is enormous diversity of character and narrative but all contain death and resurrections: a theme which is at the heart of both the Christian Passion and pagan ceremony. A host of other rituals are involved in the playing. It also provided an opportunity for the collection of alms. King Bean and Queen Pea are chosen at the end of the play - take a cake and see if you are one of the lucky pair! This King and Queen were crowned for the day as part of the general revelry, and 'Twelfth Cake' or 'King's Cake' (referring to the three Magi) was once very popular in London. The Kissing Tree or Wishing Tree was made at Christmas before pine trees were introduced by Prince Albert in 1840. An evergreen bough was hung with apples, sweetmeats, candles and decked with ribbons representing wishes. Perhaps our kissing under the mistletoe is related to a tradition of kissing under this 'Kissing Tree'. Wassail comes from the Anglo-Saxon waes hal , meaning, 'be whole'. If somebody bids you 'wassail' you may reply 'drinkhail', meaning 'your health'. The invitation to festivity in this response is obvious! And the best to us poor Mummers that bring the Wassail in! Bake apples whole (180C, 350F, Gas 5) for 20 minutes until tender but still holding their shape. In a large saucepan, combine spices and 1 litre of the ale. Bring to a bubbling heat and them simmer slowly for 10 minutes Strain if you wish. Stir in remaining ale and sherry, sweeten to taste and bring to the simmer. Serve in a punch bowl with the apples floating on top - you can add optional slices of lemon and orange. For an extra mediaeval touch: Beat 6 eggs in a 4-quart punchbowl until thick and lemon-coloured. Gradually beat in the hot ale and float the apples on top.